António Bolota, Untitled, 2014, brick, iron, concrete, and black pigment, 11' x 10' x 67". António Bolota’s latest solo exhibition treats formal issues as a science and articulates how sculpture can transform the way in which space is perceived. Here, the artist fills two rooms with three massive blocks of brick or brick and iron that resemble polyhedrons and are covered with concrete mixed with black pigment, giving them the appearance and texture of coarse sandpaper (all works Untitled and from 2014). Situated as hulking, dark forms in a sparse gallery, two of these pieces resemble hunks of charcoal against the surrounding paper-white walls. One sculpture could potentially be climbed by way of a ramp-like platform, enabling a viewer to touch the gallery’s ceiling. 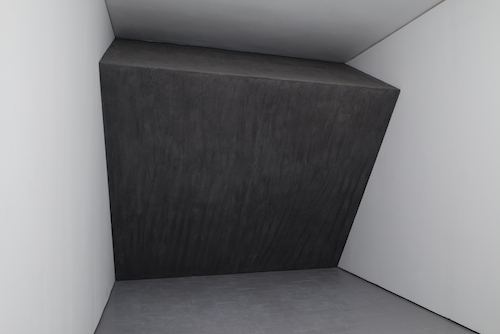 In an adjacent room, a nearly claustrophobic engagement is demanded by another towering work, which appears to plunge in the spectator’s direction as if on the verge of collapsing. Bolota’s work has always focused on having sculpture test and challenge the limits of perception, and these pieces go a step further by using the whole exhibition space as a material support. Displaying a keen, site-specific focus on the presence of a body in front of monumental form and the attending sensations it provokes, physical phenomena—including gravity, weight, attraction, balance, tension, and rigor—contribute to Bolota’s search for a vertiginous and almost dramatic experience of sculpture.